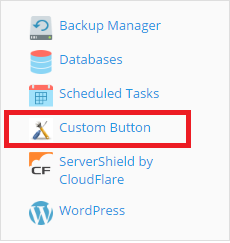 For easy access to Internet resources from the Plesk interface, you can create custom buttons that will be displayed in Websites & Domains. You can use this functionality, for example, to provide a link to your company's website, to a helpdesk, or to a custom web application. Clicking a custom button takes the user to the preconfigured address. Additional information, such as the user's contact name, subscription ID, or FTP username and password, can be passed along as well. The custom buttons can be reserved for your personal use, or shared with all other users created under your subscriptions. Background image. Square images work best. We recommend using a 16x16 pixels GIF or JPEG image for buttons placed in the navigation pane, and a 32x32 pixels GIF or JPEG image for buttons placed in the website tools area. Do not use frames. Select this checkbox if you want the target URL to open and replace the Plesk interface. Leave the checkbox cleared if you want the target URL to open within the Plesk interface.